With early voting tabulated along with ballots in two of the seven precincts, Chang had 1,336 votes as of The Outlook’s press deadline this week, followed by Ryan’s 988 votes. Newcomer Corey Barberie checked in at third with 877 votes. In the event this pattern holds after all precincts are reported and mail-in ballots counted, Chang would return for a fifth term and Ryan her second, bringing back more than two decades of combined experience to SMUSD’s school board. Barberie, a financial controller for a Hollywood production company, appeared to have distinguished himself among the five newcomer candidates vying to join the venerated school district’s board. His campaign focused on bolstering the district’s financial accountability to voters increasingly skeptical of how the district spends both limited state funding and the generous donations of local families and organizations. 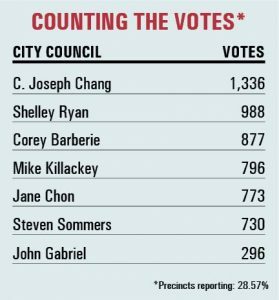 Trailing Chang, Ryan and Barberie at The Outlook’s press deadline were Mike Killackey with 796 votes, Jane Chon with 773, Steve Sommers with 730, and John Gabriel with 296. Once the election is certified by Los Angeles County, the three victors will be sworn in at the Dec. 11 Board of Education meeting. The updated school board will break from the gates with a couple of high-priority issues to handle. SMUSD voters will once again head to the polls on Feb. 26 to decide whether to renew one of the district’s two parcel taxes for another six years. The tax would be $366 per parcel each year and generate around $1.6 million annually to fully fund 14 full- and part-time positions throughout the district. Although school board members cannot directly campaign for the parcel tax, the district is free to disseminate any information about it, and voters are likely to take note of perceived confidence or enthusiasm over the tax and its uses. And, of course, if voters turn down the renewal, the school board will likely face the tough decision of laying off the people in those positons. The new board also will have to get to work on hiring a new superintendent to replace Alex Cherniss, who served four years before leaving the district in September to take the same job with Palos Verdes Peninsula Unified School District. Loren Kleinrock, whom Cherniss succeeded in 2014, has resumed his old gig in an interim capacity. Once the school board openly declared it would wait until after the election to begin the search (with one incumbent opting not to seek re-election, a change in the board’s composition was guaranteed), candidates began to focus on what sort of manager they would advocate hiring to lead one of the state’s most academically successful school districts. The newcomers among the candidates especially emphasized the need to bring in someone with a proven track record of curriculum development. The school board also will probably have to reckon with a facilities needs assessment and accompanying bond proposal that became a topic of contention earlier this year after the current board and administration publicly considered it — and ultimately shelved it after a mounting public outcry at its scale. If they ultimately choose to try reselling it to voters, board members will likely need to refine the way some facility projects are prioritized and justify the costs for others. One lightning rod in particular was a $62 million line item for a performing arts center at San Marino High School. The previous school board election, held on Nov. 5, 2013, had a 22.14% percent turnout by SMUSD voters, with 1,935 of the 8,738 registered voters casting ballots that year. Voters that year picked Nam Jack (with 1,242 votes), Ryan (with 1,177 votes) and Chang (with 1,000 votes) for the three seats, with a fourth candidate, Phil Chan, coming up short with 844 votes. Ryan was elected to her first term in that election and Chang to his fourth, having joined the school board after the 2001 election. Jack, who was elected for her second term in 2013, did not seek re-election this year. School board members Lisa Link and Chris Norgaard faced no challengers when their terms were nearing an end in 2015, assuring them of another tour in office. 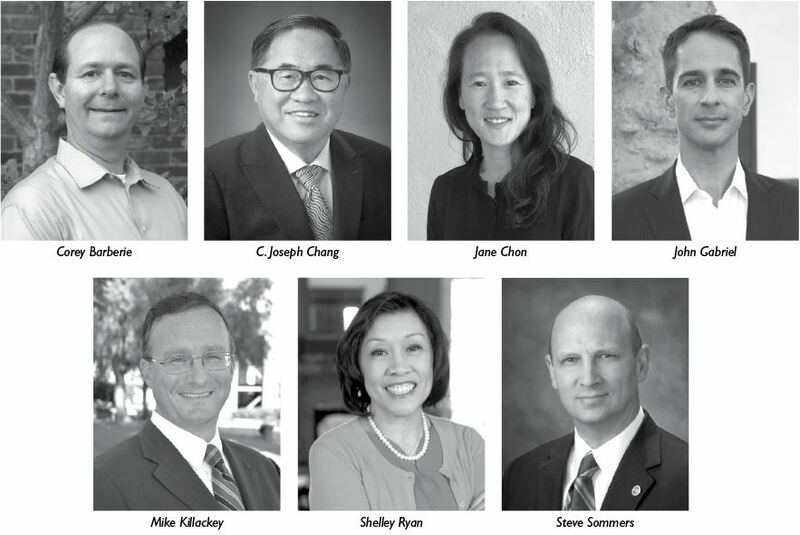 Although initially they were running for four-year terms, the board decided to extend their terms — and those of Jack, Chang and Ryan — by a year to align the district with the county for even-year elections after a state mandate in 2016. Link’s and Norgaard’s seats will be up in 2020.